If you are planning a first-time camping trip, or have not been camping in a while, there may be some things you are wondering about as you plan your next tent adventure. You'll certainly be considering what you should put under your camping tent or if you need a ground cover or tarp at all. Setting up camp is an essential part of the camping experience, and since the camping tent is your shelter for your wilderness getaway, erecting and staking your tent properly is key for your comfort. Every tent is a little different and your set-up has a lot to do with your camping gear, the weather, and the location of your campsite. Some forgo using a ground cover but that is not recommended. No matter which ground cover you choose to use, make sure to pitch your tent on high ground. Scan the campsite and pick the area that sits higher than the rest. Putting some sort of ground cover or tarp under your tent is essential for the durability of your tent and to keep it warm and dry. Different terrains require different solutions for your tent and ground cover. There are a few key things to keep in mind when you pitch your tent and decide what kind of ground cover you should use. In woodlands and fields, put a tarp under your tent but be sure to fold it under so it doesn't extend beyond the edge of the tent. If the tarp extends too far, even dew will run down the tent walls and collect under your tent. When camping at the beach, don't put a tarp under the tent, but rather inside the tent. Sand camping is very different and water will seep into, if not float, your tent in heavy rain if you put a tarp under the tent. Unless you are in a low spot at a sandy campground, a tarp under the tent is not necessary since water absorbs quickly into the sand. A third way to place a tarp is to put it over the tent, and possibly in combination with one inside and/or under. Keep the wind in mind too, because wind adds a degree of difficulty in keeping a tarp over a tent and also sometimes blows rain sideways, possibly through the side seams of your tent. So place your tarps for the maximum protection. 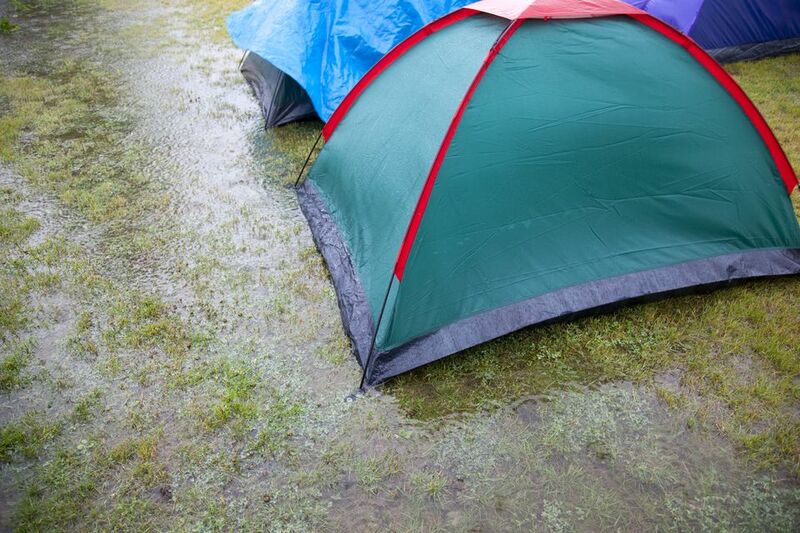 Tent walls were meant to breathe and are not waterproof, merely water resistant. The fly over the tent, as well as the floor, should be coated with waterproof protection when you purchase it. Be sure to use seam sealer on all seams of new tents, and once again each year or so before that first camping trip of the season. Some tents offer the option of buying a footprint. However, these footprints can be expensive because they are designed for the particular tent and offer the best-fitting option. If you can afford this, it is a good option. Then, use your tarp as extra protection over the tent or around camp when the weather turns bad. Whatever option you choose, always use a ground cover under your tent. This will help keep moisture from seeping through your tent, getting your gear wet, and will protect the life of your tent. Abrasive ground will wear out the floor of any tent no matter how durable it is, so ground cover or tarp protects the tent.